For many people, the idea of a muzzle evokes a long-standing association with aggressive dogs. That impression can create feelings of fear and worry when people hear about or witness a dog in a muzzle. 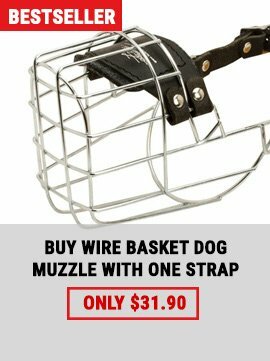 But, muzzles are not just for aggression anymore. It's high time to dispel those negative mental images. Rather than vilifying muzzles, it's time to appreciate muzzles for all the good things they can do for dogs. For example, the use of a muzzle has been an important tool in behavior correction. 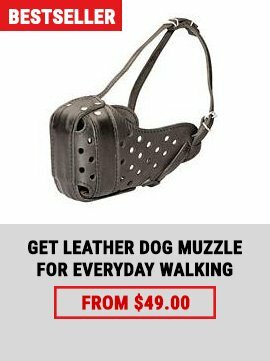 The muzzle allows you to be safe as you work around other dogs, or around people. Muzzles are also a valuable safety tool to employ when introducing another species to your dog. Traveling abroad with your dog is still another reason for teaching your dog to love a muzzle. More and more countries now require dogs of certain types and/or weights to wear muzzles. Every dog, when being out, walking around or training, should have proper equipment for protection, safety and comfort. Using this Leather Basket Muzzle you provide your pet with free air circulation, which is obligatory for long time walking or exhausting training or working hours. It is easy adjustable with soft, but strong leather straps, which makes it nearly impossible to dislodge it with his paws. The special design of this Muzzle allows your pet to feel free and safe, it will never stick to dog's snout so you shouldn't worry about his health. The easy adjustable neck strap is made of full grain durable leather. 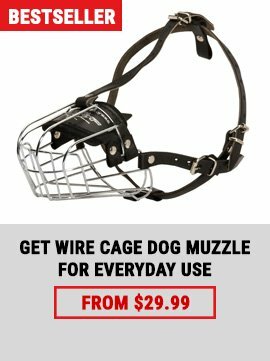 This Handcrafted Wire Cage Muzzle provides perfect air ventilation and it's multifunctional in use. Your pet will have possibility to drink water freely, to breathe easily and to open mouth whenever he wants. And he can wear it for a long time, the only caution is not to leave him unattended when muzzled.